The first couple days we were so busy getting situated in our apartment that we really never left the area. 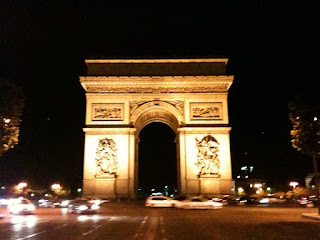 Finally, last night (Thu) about 9:30p we decided to walk the Champs-Élysées, perhaps the most famous street in the world. Took the subway (for the first time since we arrived) from Lexembourg (RER B) to Les Halles and switched to Line 1 to Place de la Concorde (the largest square in Paris) at the eastern end and walked up the right side of the street to the Arc de Triomphe at the other end and then back down the other side, hopping on the subway at the George V (Line 1) station and returning home by midnight. The street is lined with some of the largest stores representing some of the most famous brands in the world. And it is always crowded. This is August and Paris is largely dead with many shops closed and residents on holiday. But not on the Champs-Élysées. If you want to find life (granted, it is tourist life but it as diverse tourist life as you will see anywhere) at any time of day or not, this is the place to be. 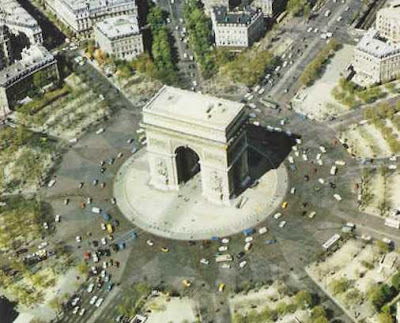 The roundabout was memorably parodied in National Lampoon's European Vacation as the Griswolds get stuck circling the monument for hours in their car. I was going to post the youtube video replaying the segment but it has, sigh, apparently been prohibited due to copyright considerations.